After a brief hiatus, I'm back! With more dog photographs! Click here to see Vol. 3. But Corgis weren't the only dogs I met that day. I also met Cocker Spaniels, Huskies, Pit Bulls, Pugs, an English Bulldog, a Westie (! )...and, well, you'll just have to see the rest! So, as a bonus blog post in our So Cal Corgi Beach Day series, I wanted to include the "Honorary Corgis" who also joined the party for So Cal Corgi Beach Day. This gorgeous Aussie joined the aqua fun. I believe this may be a Shiba Inu, probably in its puppy stage. Speaking of a Shiba Inu, I think this royal three-legged friend is also a Shiba Inu. This sweet Toy terrier could probably fit in the palm of your hand. As a Westie owner, everytime I see another Westie I can't help it. Do you know what dog breed my wife adores? Boxers! This adorable Boxer is Zoey, and she's not afraid to lick your face and tackle you down with a hug. My wife grew up with a sweet Boxer-Border Collie mix named Bailey, so the Boxer family has a precious paw print in her heart. With that in mind, I spent extra time photographing Zoey. When I saw Zoey distracted with a stick, I knew I had a great opportunity to make some fun photographs of her. So I got down on her level, and was able to make these funny and charming photographs of Zoey. Do you want to see something else really funny? This isn't the funny one yet. It's going to be the next six images. But I loved this photograph because you can see the trail of water following the whoosh of the tail. Can't you just hear the stick plop, and see the goofiness of this moment, and the sad (but really funny!) look at the end? Silly dogs. We humans don't deserve you. This gorgeous, patriotic Pit Bull mix didn't hesitate to model for me. Neither did this little terrier. I was taking a break, enjoying some lunch, when I saw two dogs and their human family sit at a table near me. So I stopped mid-bite, and went over to ask if I could photograph their beautiful furry kids. All of these dogs are filed under, "dogs-that-heard-me-photographing-other-dogs-and-wanted-to-join-in-the-fun." "What about Huskies! 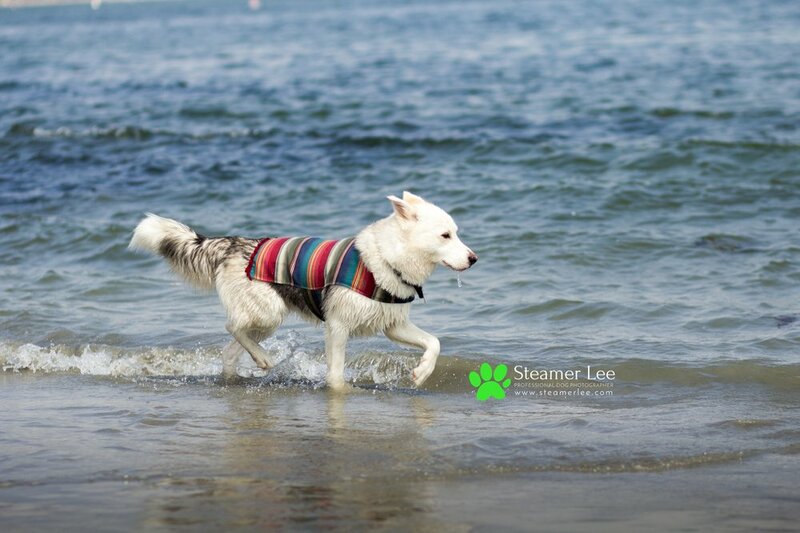 I want to see photographs of Huskies!" I LOVED this sequence! Especially the moment of the photograph in the middle, when the dog looks over in mid-stride, and its legs were stepping at just the right moment. And there's a closer look at each frame. PUGS! I brake for Pugs. This Pomeranian is Chewie, co-pilot of the Millenium Falcon. ...And he will have his vengeance, in this life or the next. In the likely case that I just lost you there, this fierce face is named after the protagonist (portrayed by Russell Crowe) in the motion picture, Gladiator. And just like that, we've reached the end of this Corgi Beach Day tour. Thank you for your time! I hope you were able to enjoy Corgi Beach Day through the magic of photographs. Wow! These are all such beautiful photographs. I would love to have a picture like one of these hanging in my home living room or office! Or, Hey! I know that dog! She belongs to a friend of mine, and I know her birthday is coming up! I would so love to get her a picture of her fur-baby for her birthday! That would make the perfect gift! Now you can do just that! I made a beautiful gallery of Corgi Beach Day, filled with 200 photographs from Corgi Beach Day. July 2017, Long Beach, CA. Click here to order Paw Prints. Please share this gallery with everyone you know who loves dogs. Custom artworks starts at $20. You'll get Free Shipping for orders over $75.00. I'd be so grateful for your business. She's begging for some new toys. Dogs are family. But it's a hassle trying to take good pictures of them. Imagine how your dogs can look with my professional dog photography. Dog-parents who hire me invest in the most beautiful photos of their dogs that they have ever seen, and their homes feel revitalized with elegant portraits of their furry family member. If you're in the Southern California area, you should reserve your dog's photography session now. Newer PostMy Dog Photos were featured at Union Market, Mission Viejo!